In honor of centennial of the end of the First World War, the Reuther Library is pleased to announce the opening of the exhibit Armistice 1918: Detroit and the End of the Great War. 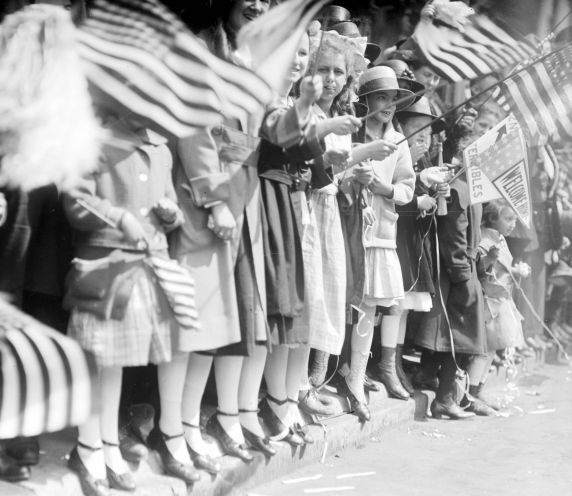 The exhibit shares a brief, candid glimpse of the massive celebrations that marked the surrender of Germany and the return of the troops home later in the Spring of 1919, capturing the joy and relief of citizens and soldiers alike. The photo prints, made from original 5x7 glass plate negatives, are stunning in both their content and clarity. The exhibit will be on display in the Leonard Woodcock Gallery through Spring 2018. The selection of images on view are a small subset of hundreds of like images from the Detroit News Collection. The collection of over 800,000 original negatives shot by Detroit News Staff contains views of military movements within the state, including soldier life and training activities at Camp Custer and Camp Grayling, civilian efforts to support the war, such as fundraising and material conservation, scenes from Detroit’s booming wartime industry, and local celebrations. For a deeper look into what life was like in Detroit during the war, please visit our web gallery Stills from the World at War or the Virtual Motor City. To learn more about Detroiter’s activities overseas during the war, please consult the Harper Hospital Records, which includes material from Base Hospital No. 17 in Dijon, France, where mobilized Harper staff served during the war. Photographic material from the collection, which includes images activities and units within Base Hospital No. 17, as well as personal snapshots from Harper nurses who stayed in Europe after the Armistice to work with war orphans, can be viewed by appointment. Please contact reutherav@wayne.edu to do so.